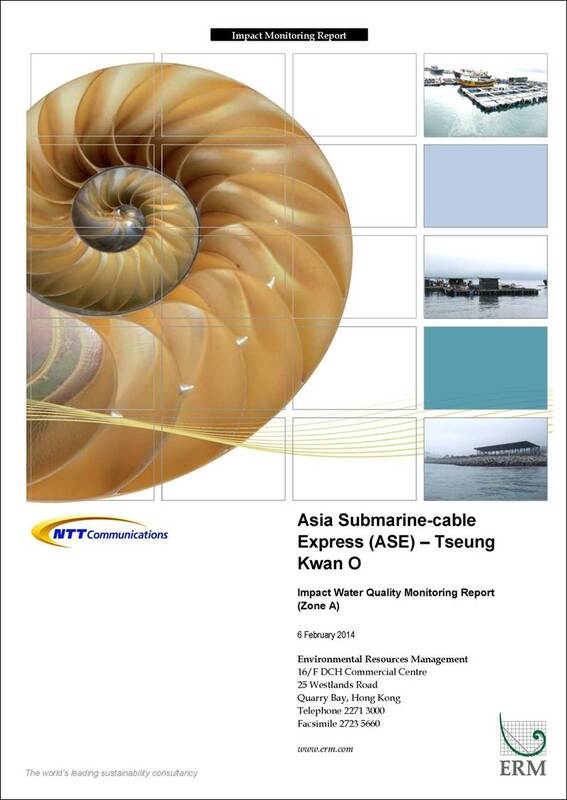 The submarine cable installation works for the Asia Submarine-cable Express (ASE) cable system commenced on 12 January 2014. This is the 2014 Third Weekly Impact Water Quality Monitoring Report presenting results and findings of the impact water quality monitoring conducted during the period from 26 January to 1 February 2014 in accordance with the Updated Environmental Monitoring and Audit Manual (Updated EM&A Manual). During the reporting period, submarine cable installation works were conducted in Zone A (See Figure 2.2), which included diver inspections (not involving water jetting) and cable burial works (using water jetting). Note no works were conducted on 28 January 2014, when the Networker cable barge was berthed; nor from 31 January to 1 February 2014 inclusive, due to the Chinese New Year Holiday. Five monitoring events were scheduled in the reporting period from 26 January to 1 February 2014. Monitoring events at designated monitoring stations in Zone A were performed on schedule on 26-30 January inclusive. Note no monitoring works were conducted from 31 January to 1 February 2014 inclusive due to the Chinese New Year Holiday. 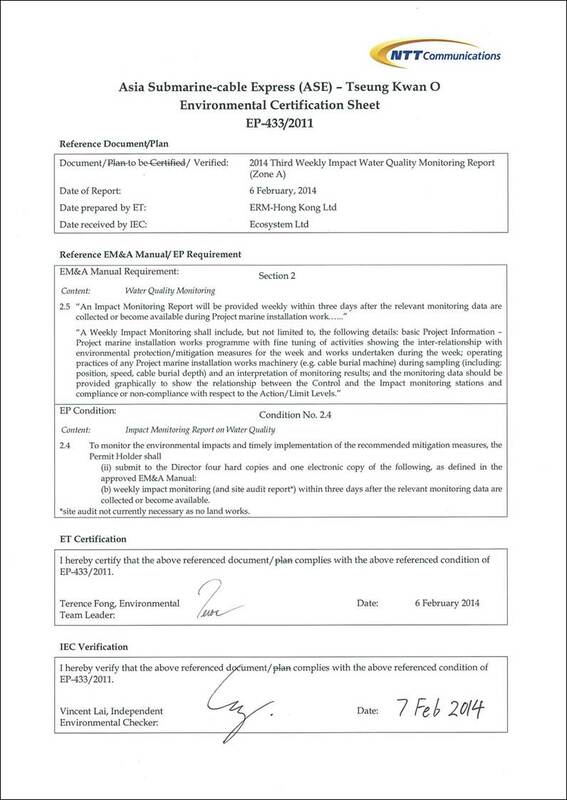 No exeedances of Action and/or Limit Levels were recorded during the reporting period. - Equipment stowage (no water jetting work). Note no cable installation works will be conducted on 2 February 2014 due to Chinese New Year Holiday and the cable installation works will be completed on 5 February 2014. Hence no impact monitoring events will be scheduled on 2, 6, 7, and 8 February 2014. 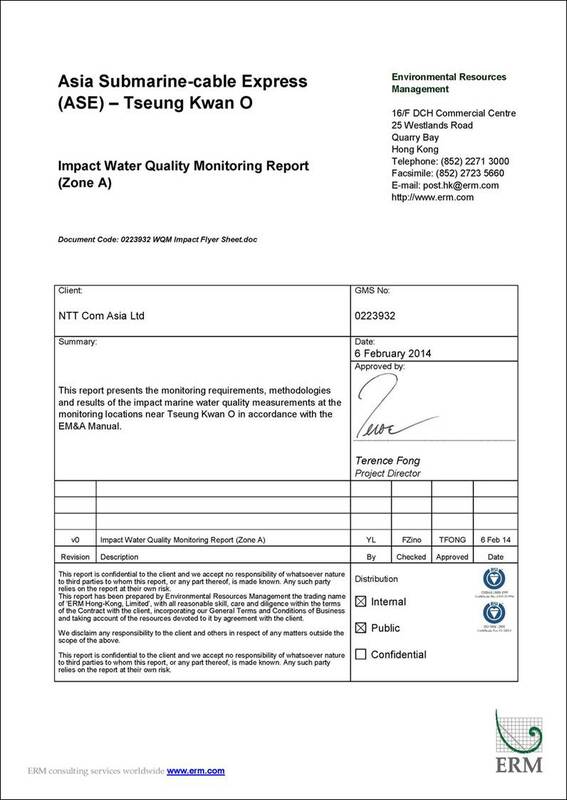 This 2014 Third Weekly Impact Water Quality Monitoring Report, summarises results of impact water quality monitoring as part of the EM&A programme during the reporting period from 26 January to 1 February 2014. Impact monitoring started on 12 January 2014, when the cable installation works commenced in Zone A. Impact monitoring is being conducted on a daily basis as the cable installation works proceed in Zone A, including five days within the reporting period (no works were conducted on two days over the Chinese New Year holidays). The first week of impact monitoring was reported in the 2014 First Weekly Impact Water Quality Monitoring Report issued for the reporting period 12-18 January 2014 inclusive. The second week of impact monitoring was reported in the 2014 Second Weekly Impact Water Quality Monitoring Report issued for the reporting period 19-25 January 2014 inclusive. This Report presents the results and findings from the third week of impact monitoring, conducted from 26 January to 1 February 2014 inclusive, at the monitoring stations in Zone A. No impact monitoring works were conducted from 31 January to 1 February 2014 inclusive due to the Chinese New Year Holiday and no cable installation works being conducted. During the reporting period, submarine cable installation works were conducted in Zone A (See Figure 2.2), which included diver inspections (not involving water jetting work); and cable burial works using water jetting. Note On 28 January 2014 the Networker cable barge was berthed alongside and no works conducted. No works were carried out from 31 January to 1 February 2014 inclusive either, due to the Chinese New Year Holiday. A total of five monitoring events were scheduled in the reporting period from 26 January to 1 February 2014 (Annex A). No impact monitoring works were conducted from 31 January to 1 February 2014 inclusive due to the Chinese New Year Holiday and no cable installation works being conducted. Continuous water sampling was taken at the impact monitoring stations in Zone A at approximately 4-hour intervals (subject to the weather conditions and travelling time between stations) on a daily basis, so collections were made at least four (4) times per day. Monitoring events at all designated monitoring stations within Zone A were performed on schedule. No major activities influencing the water quality were identified during the reporting period. The levels of depth-averaged Turbidity showed variation throughout the third week impact monitoring (Figure D1 of Annex D). The differences of Turbidity levels among the stations (within the same monitoring round on the same monitoring day) were recorded to stay within a limited range of 1 NTU. Levels of depth-averaged SS measured during the third week impact monitoring showed fluctuation with time (Figure D1 of Annex D). Some differences of SS levels among the stations were recorded during the monitoring period but no exceedances of SS Action and/or Limit Levels were recorded during the reporting period. The overall levels of DO at all the water depths (surface, mid-depth and bottom) during the third week impact monitoring were of similar magnitude at all the stations (Figure D2-D3 of Annex D). Minor fluctuations of DO levels at all water depths were detected during the reporting period. Minor differences of DO levels among the stations were also recorded at all water depths. In general, the water quality of Zone A was stable throughout each sampling day. The overall Turbidity, SS and DO levels at the impact stations were of similar magnitude to the measurements taken at the control stations which were located far from the area of cable installation works and wouldn’t be affected by the repair works. Given this information, any variation amongst the impact monitoring measurements are considered to be natural background variation rather caused by the Project cable installation works. Note no cable installation works will be conducted on 2 February 2014 due to Chinese New Year Holiday and the cable installation works will be completed on 5 February 2014. Impact water quality monitoring is scheduled to be carried out in parallel with the cable installation works in Zone A from from 3 to 5 February 2014 inclusive. No impact monitoring works will be conducted on 2, 6, 7, and 8 February 2014 in accordance with cable installation work schedule discussed in Section 6.1. This 2014 Third Weekly Impact Monitoring Report presents the results and findings of impact water quality monitoring undertaken in Zone A during the period from 26 January to 1 February 2014 in accordance with the Updated EM&A Manual and the requirements under Environmental Permit (EP - 433/2011) for the Project. No exceedances of Action and/or Limit Levels were recorded during the impact water quality monitoring period. No complaints or summons/prosecutions were received either during the reporting period. Water quality in Zone A was generally stable throughout the reporting period. Levels of Turbidity, SS and DO levels showed fluctuation over time during the reporting period. In general, the overall water quality at the impact stations was found to be similar to that at the control stations.